Conceived by the mad scientists of mountain biking, Evil’s new 120mm trail bike, the Following, is here to obliterate expectations. This bike is as fun as it is versatile, able to climb, slash berms, rip chutes, and blast gaps with ease. It’s a completely new take on 29-inch wheels. 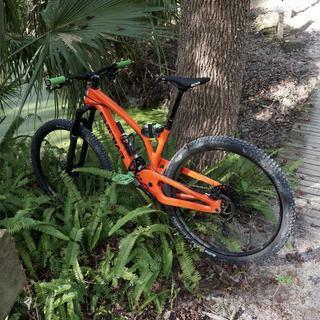 With a sinfully fun carbon fiber frame and Evil’s outstanding DELTA System (created by suspension wizard Dave Weagle), the Following offers low and slack geometry with short, responsive chainstays and an adjustable bottom bracket height. The Following is a bike that can suit a range of riding styles. Your Evil Following will arrive expertly spec’d with a Jenson Exclusive SRAM GX Eagle build kit. This makes for a tasteful blend of performance, reliability, and fun that can only be found at JensonUSA. The SRAM 12-speed drivetrain and 10-50T cassette provide an ultra-wide range to climb steep and descend fast. Shimano’s SLX hydraulic brakes offer ample stopping power for navigating tricky situations. A Rock Shox Pike RCT3 fork and Monarch rear shock smooth out the trail in front of you and a Race Face Aeffect cockpit keeps you in control at all times. The Following frame is made with uni-directional one-piece carbon fiber and features integrated chain guides and cable routing. The downtube and chainstays feature rubber protectors, and the rear wheel thru-axle dropout is stiff and stable. If you are looking for a bike that can handle everything you want to ride, the Evil Following needs to be your next bike. 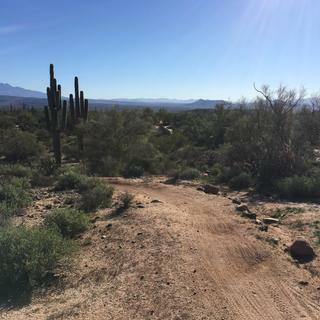 From fast flowy single track to steep rocky chutes and everything in between, the Following was designed to handle it all. 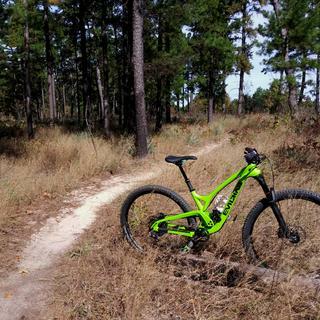 Push your riding further and attack the trail with more confidence than ever before. Old version of Evil The Following but with a modern groupset. Initially I thought it would be a little heavy but it rides uphill no problem with the 32-50 gearing. Plus the ride down is well worth the effort. Just about ready to ride right out of the box. Very happy. Frankly, I am in love with this bike, and it is a lot of bike for the money! I upgraded the brakes to Shimano XTR brakes for $150 and that was the icing on the cake for this build. The bike feels most confident at faster speeds both up and down. Especially with climbing, it wants to move a little faster than the Eagle gear, but this is still nice to have on stepper climbs. I think their frame designs are the best looking on the market as well. If you are considering this build, upgrade the brakes and you wont be upset. 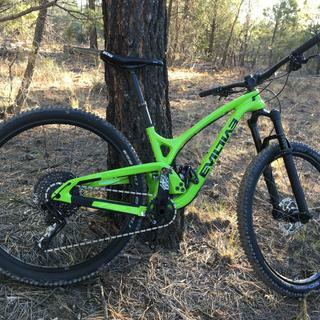 Great all around bike for the trails and mountains. My friends love how fast it responds on the pedals and how fast it descends on the trails. Evil & JensonUSA know how to put bikes together! Thank you JensonUSA for all your support too. The bike has been great the service has been great Jenson would be a company I would purchase for my gas and evil has been great. Is this a 2018 build? 2017? What year? description says internal cable routing, but this pic looks like cable routing is on the outside. anyone can explain? BEST ANSWER: It is a mix. The dropper post is full internal, there is internal routing for a front derailleur (unused). The rear derailleur is internal through the rear stay. The remainder of routing is external with plastic housings. Anybody know what the specs are on the E*Thirteen wheel set in this build (i.e. internal rim width, total weight)? BEST ANSWER: I am pretty confident this is a 2017 frame. However, I have not confirmed. A lot of the parts are 2018 though. Can this bike be fitted with 27.5 x 2.8 plus tires? How wide can the 29” tires go? BEST ANSWER: Only the rear is boost spacing so the front will not fit a 27.5+ tire size. How much does a medium sans pedals weigh? BEST ANSWER: Mine is 28 pounds with about 3 oz. of Stan’s in each tire. It’s a “small” but I’m a 5’8” 175 lbs guy and it fits great.